After the Summer holidays, my weekend competitions are back! Today’s prize presents the opportunity to win one of two volumes from The Lang Lang Piano Method series, published by Faber. The fourth and fifth books have just been released and are on offer this weekend. These publications are a continuation of the series, providing the conclusion to the method. You can find out much more about Lang Lang’s books here and you can purchase them here. To be in with a chance of winning, please leave a comment in the comment box at the end of the post and I will select the winners on Sunday evening (British time). 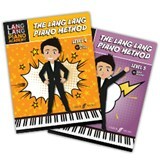 Faber Music are also giving away some free Lang Lang Piano Method Teachers’ Packs (pictured above), including pencils, stickers, bookmarks and sticky notes. If you’d like a pack, simply send an email requesting one to marketing@fabermusic.com with your name and postal address. My pupils would be floating with happiness if I appeared with these goodies!!!!! Hi there, I’m really pleased to have discovered you….look forward now to Friday’s to see what interesting post you might have in store…thank you so much. Lang Lang looks pretty cool……! The Lang Lang Method looks amazing ! Would love to win! Great prize for aspiring pianists! My daughter would love these. I think this new set of tutor books looks very promising. Just about to start a student on Book 3, as the series she was on was not inspiring enough. Thanks for your blog! I’m a great fan of Lang Lang. His performances inspire my pupils – loved his appearance on the One Show. Have been using his Piano Academy books and am now keen to try his piano method books. I am being sent the Teachers pack from Faber, but now need the books to go with them…….! Thank you so much for the giveaway, I am always looking forward to new teaching methods, books to explore and polish piano playing myself and piano teaching skills for my students. Thank you for this, Melanie. It would be a fabulous resource to own. Your review of the course makes it all the more desirable! Thanks for the giveaway! I always learn something new from every method I review! I’ve just recently discovered the Lang Lang series and I can’t wait to try it. I would love to win! I just taught a group piano class and presented on Lang Lang – my students thought he was incredible!! Would love to use his method with my kids! Thanks for the giveaway! It would be great to try out this new methods book with the students! This is wonderful. I hope to try this with my student. Any method books which inspire the student (and the teacher) are great. I would love to try this method with a student. Thanks for the opportunity. I’ve just taken on an adult student who learnt piano when she was a child and I am looking for a book that will help to refresh her skills and move her forward. I think these books fit the bill perfectly! Lang Lang is such an inspiration to me and my piano students – always a joy to listen to and to watch. Would love to share his teaching with my students. I love researching different methods. Fingers crossed I can add this to my collection. astounding book!!! a very artistic image and perfect motivation for students! Sounds fab. I’d love to try these out with some of my students. I’ve read such good things about Lang Lang’s books, I’d love to give them a try! Sounds like a very fascinating method series! Possibly too late to enter but just to say I’ve just started using volume 1 with a pupil & it’s going really well!